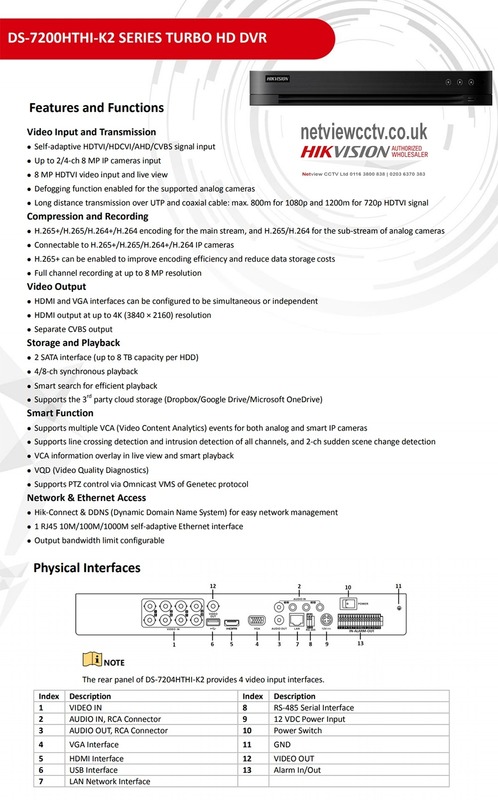 This DVR also has the additional benefit of supporting an additional 8 (max 16) IP cameras of up to 8MP Resolution. Connection to the internet is a breeze with the Hik-Connect Setup without any technical or port forwarding knowledge or expertise required. All analog channels could be disabled for more IP channels access. For 16-channels or less channels devices, The number of IP channel which can be added to HU/HT is N as default (N represents the number of analog channel); if the analog channel is disabled, the number of IP channel will become N+N. For 16 or less channels devices , the number of IP channel which can be added to HQ is N/2 as default (N represents the number of analog channel) ; if the analog channel is disabled, the number of IP channel will become N/2+N. For more than16 channels devices , the number of IP channel which can be added to72 HQ is 8 as default; if the analog channel is disabled, the number of IP channel will become 8+N (N represents the number of analog channel). the number of IP channel which can be added to73/81 HQ is 16 as default; if the analog channel is disabled, the number of IP channel will become 16+N (N represents the number of analog channel). the number of IP channel which can be added to 90 HQ is N as default; if the analog channel is disabled, the number of IP channel will become N+N (N represents the number of analog channel). New support to recover device password via reserved email.